ReSeal is a technologically advanced and environmentally safe commercial grade tyre sealant for use in on-road and off-road tyres. Simply, ReSeal is pumped into the tyre when un-inflated and remains a liquid inside the tyre. When inflated the ReSeal circulates the tyre and wheel keeping the tyre cool and wheel lubricated – thus minimizing wheel corrosion. Stops air loss from punctures in mower tyres to damaged beads in earthmover tyres! Added to a tyre (tubeless or tube type) to STOP AIR LOSS. ReSeal repairs punctures and seals tyres instantly and permanently, while not affecting the balance of the tyre. In the event of an air leak, ReSeal’s patent formula rushes to the area and provides an AIR TIGHT seal. This works extremely well for air vent leakage and bead leakage. What about punctures? ReSeal’s patent formula includes KEVLAR fibers. These Kevlar fibers are super strong and similar to what are used in bullet proof vests! 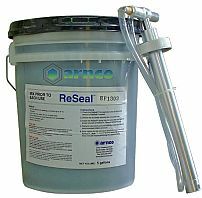 ReSeal has the ability to seal a puncture hole up to 7mm in diameter.